Work was suspended at 2pm today due to heavy rains so I was able to go home early. Since I had nothing else to do and I didn't want to sleep yet, I decided to see updates on my Facebook account and watch some videos online. 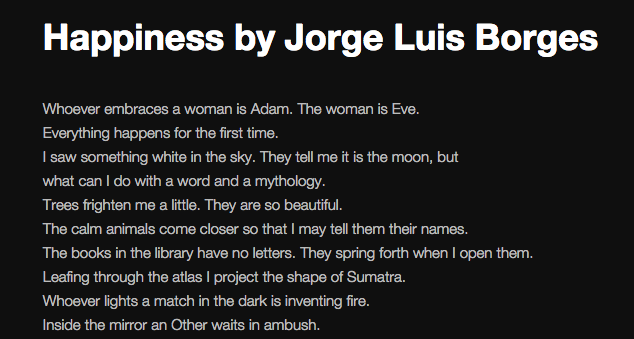 The first half of the poem Happiness by Jorge Luis Borges. Read in full here. Usually, I would watch episodes or movies of my favorite anime shows or music videos, but tonight I wanted to go back to my college days. So I searched for a video of one of Jorge Luis Borge's poems. I found a lot of them too but mostly in Spanish. I found one with the title Happiness and I got curious as I had never encountered this poem of Borges before but sadly the account of the sharer on YouTube was suspended due to copyright issues. I found another video of one of his talks on poetry instead. I'm glad I listened to this one. It was a delight to hear the words. This takes me back to my undergrad years when I spent some of my leisure time poring over works of magic realism. Borges became one of my favorites then and with this one, he still remains on top of my list of pleasurable reads--or mind boggling as some find it to be. I just love the metaphysical concept of his poems and even his short stories. Yes, I am in geek mode, I know so I will stop the praises here. If I go on some more, I might end up posting a critical review--read: term paper/analysis--instead. On a rainy night, alone in your room, read a poem like this and you just might get into the mood to wonder about and analyse your own life--or existence on this planet in general or universe even--and end up in awe or more likely with even more questions. I can't say that I agree with the title of the poem though. Listen to it and you'll understand what I mean. I'm also not sure if you will be able to sleep or lose sleep instead after listening to it. (Being an insomniac, I really wouldn't know.) So I guess if you're the type who has a tendency to brood over the nitty gritty stuff, you might want to avoid Borges and take up some other writer instead.